I’m talking, of course, about Tip Cline, who writes the “Tips from Tip” column in The Louisiana JAM. Readers of his column have reaped benefits from his talent as a consumer watchdog. But that’s not the only thing he’s good at. His brain is also the world’s largest repository of totally useless information, otherwise known as trivia. He’s the friend you’d want to call if you were ever on that game show, “Who Wants to Be a Millionaire?” On the other hand, you wouldn’t want to call him on moving day. I doubt that I could get him to help me move my liquor cabinet, even if I offered him all the Ancient Age whisky therein for his effort. Tip and I square off most Tuesdays at a local pub, and I have about as much success against him as a zombie would against a Russian chess master. Well, I lie. The zombie would likely eat the chess master by the second or third move. Tip and I much prefer Buffalo wings. Tip likes his cooked in the hottest sauce that the bar has to offer. The waitress comes out in fireman’s gear when she brings his order. I’m surprised that his game console doesn’t melt when he touches it. It’s too bad; I might have a chance of winning if his console disintegrated. Tip knows everything there is to know about geography, history, film, and science. He’s memorized the record books for every major sport including bocce ball. But lately, there’s been a curious scarcity of pop music questions when we play, leading me to wonder whether Tip has an inside connection at the game company. What’s more, we seem to get a preponderance of questions related to Medieval-era weaponry, a subject at which he excels. I now believe that my only hope of beating him lies in using diversionary tactics. I thought about hiding the menu when the waitress comes by, thereby causing him to miss a question while he searches for it. That won’t work, however, since he orders the same thing every week, and all of the wait staff know it by heart. I thought about bribing the staff to give him a game console with a low battery, but he always has backups at the ready. I would buy him lots of beer, but even in an inebriated state, he can still spit out answers faster than a Google search. 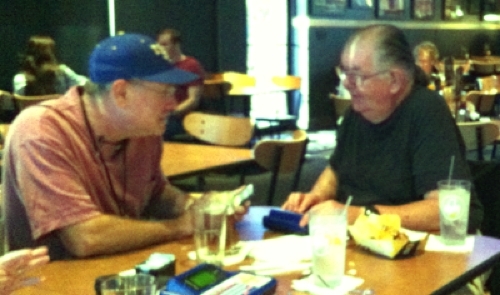 I’ve tried getting others at our table to distract Tip by engaging him in conversation at a critical game juncture. That didn’t work, either, as he can multitask better than a mother of thirteen children. He can talk, eat, drink and review his tab without missing a beat, whereas I tend to get distracted if someone asks me to pass the salt. Tip often employs this very strategy. As it is, I’m resigned to the fact that Tip has the upper hand at this game. I can only be fortunate that the rules do not call for the actual use of Medieval-era weapons.